Bacterial Slime Flux Treatment in Fort Worth, TX. Call (817) 502-9402. Cause of Slime Flux in Fort Worth TX? 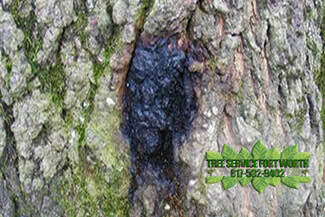 Many older, mature trees in the Fort Worth area can easily fall prey to slime flux disease. Popular tree varieties favored by this disease include, but are not limited to, oaks, poplars, maples, and elm trees. Sick trees that have bacterial slime flux has several clearly visible indications. A runny, thickened liquid gushes out of damages and cracks on the tree and frequently has a very strong, foul smell. Streaks varying in color may run down the trunk as a result of this infected liquid. If the liquid is excessive, it will kill grass and plants growing in the vicinity of the tree's base. Slime Flux is a Common Problem for Oaks and Elm Trees. Tree slime flux disease in Fort Worth TX is caused by common bacteria in water and soil and can initially invade young and old trees alike through wounds and damages to the tree. An experienced tree company and certified arborist are very familiar and knowledgeable about this common tree problem. Although bacterial slime flux in itself is usually not life-threatening to the trees in Fort Worth, a tree that has also been subjected to stress and weakened by soil disturbance due to construction activities encourages additional bacterial growth and may result in death, broken branches, and yellowish wilted leaves. When your tree is exhibiting any obvious symptoms associated with bacterial slime flux in DFW, it is of great importance to contact a Fort Worth tree doctor or arbor care professional in Tarrant County. An experienced plant pathologist will not only confirm whether or not the outwardly visible signs are indeed bacterial slime flux disease, but also will utilize their expertise to determine the interior wood color of the tree for further confirmation. If the center core wood is darkened as a result of bacterial slime flux invasion the interior wood will give the Fort Worth Arborist the indication of proper tree diagnosing. In addition, diagnosis requires the experience and knowledge of a Fort Worth certified arborist and experienced tree service company. Treatment Of Slime Flux in Fort Worth, TX. Correct treatment and proactive protection for the tree are the best defenses against bacterial slime flux disease in Fort Worth. Deep root fertilization injections by an experienced arborist that treats sick trees will present you with the evaluation and specific treatment and prevention plan for your individual needs and a one year warranty on any treatment program. Trees add beauty to your environment and strong, healthy trees require proper maintenance and care. Protect your tree from wounds to its bark which invite slime flux by limiting careless activity within the direct vicinity of the tree. Guard the tree and its root system from added, avoidable stress caused by compacted soil due to excessive foot traffic or construction projects near the tree. A Fort Worth arbor care professional will expertly diagnose the tree's condition, analyze the surrounding environment and establish an annual maintenance program to ensure the health and beauty of your tree. Updated on November 27th, 2018 by Tree Service Fort Worth. From shrub to trees to include landscapes, organic and synthetic please call us today 817-502-9402. We will find the right answers to get your property's trees and Shrubs healthy again. Effective Bag Worm Tree Treatment.